To make sure with dog demodex canis , want to use together NEXGARD SPECTRA & ADVOCATE. it is okay? If you use Advocate, we recommend Nexgard (not NG spectra) to use with it. That would be a cheaper option for you for the same level of coverage. I seen where you told a lady in Feb that Advocate does not cover fleas...yet it shows fleas on the package? Advocate covers fleas, however it doesn't cover ticks. Love to buy this product but I see it doesn’t cover ticks ? Is that right ? You are right. Advocate doesnt cover ticks. You can try Nexgard Spectra which currently covers the widest spectrum of parasites. Hi, I would like to ask if Advocate multi is Water Resistant Formulation? If not, which one of your brand has Water Resistant Formula? Yes, Advocate is water resistant and it won't wash off. 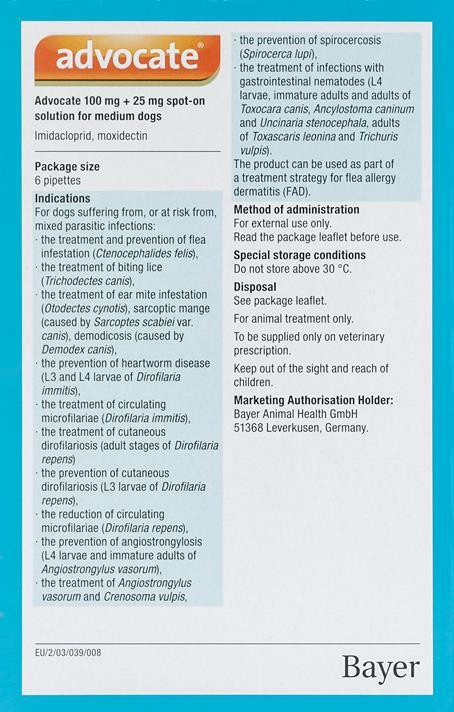 Speak with your vet about giving either of this medication to pregnant dogs. Any pest control medication should be used with great care and caution when it comes to pregnant animals. You have made life easier by offering automatic refill on my dogs "Advocate" . Always satisfied and have been getting their meds for the last several years with you. Great price, great product, free shipping, how much more could you ask for. Would recommend this to anyone who cares about your pets . They NEVER have fleas. I love the service and the price I get for this fine product for my beloved pets (3 dogs). I get the automatic every 3 month service and they never forget or they are never late, which is so important to the health of my pets. What a relief to have this taken care of automatically. Thank you so much for your service.